Everyone can help protect children in our community! Children deserve to grow up in a loving and caring environment, free from fear, harm and violence. While The Children’s Aid Society has the very important, legal responsibility to keep children safe, we can’t do this alone. We rely on the help of the public to keep our children safe, by being alert to the signs of abuse and neglect and making the call to help a child at risk of harm. This collaborative approach unites communities to work towards the best outcomes for children and families. What are the signs of abuse and neglect? Unexplained injuries, fear of a specific adult, difficulty trusting others or making friends, sudden changes in eating or sleeping patterns, poor hygiene, secrecy and inappropriate sexual behaviour may be signs of family problems and could indicate a child is being abused or neglected. Please remember, you don’t need to be sure that a child is being abused or neglected – call The Children’s Aid Society of Haldimand and Norfolk to share your concerns and we will determine if a child is in danger. The CAS responds to reports about a child’s safety and provides child protection, family support or referrals to other community services. Wherever possible, the Society works with families to keep children safe and protected in the family home. 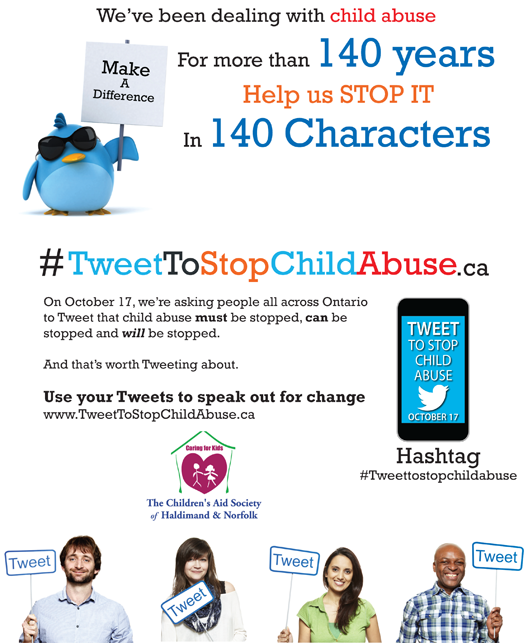 Please visit our website at www.cashn.on.ca for more information about our services and view a short video inviting community members to #TweetToStopChildAbuse on Friday, October 17. You can also visit www.useyourvoice.ca for information specific to this campaign. If you have a concern for a child or would like more information, please call The Children’s Aid Society of Haldimand and Norfolk at 1-888-227-5437, locally at (519) 587-5437. We are available 24 hours a day, 365 days a year.